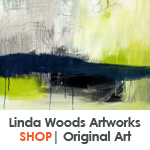 Mixed-media artist Linda Woods specializes in designing and licensing art for home decor and accessories, corporate, hospitality, and healthcare markets, as well as the motion picture and television industry. She is the co-author of the best-selling books Meeting In The Ladies Room, Journal Revolution, and Visual Chronicles. Combining words and images, Linda's art pieces capture the energy of the city, illuminate the Zen in the garden, and reveal the hidden stories in every-day life. Widely acclaimed for her unique perspective on self-expression and the creative process, Linda has appeared on national television, as a guest on “The View,” and in numerous books, magazines, and exhibits worldwide. Her editorial photography has been featured in national and international advertising campaigns. Prints and home decor items featuring Linda's artworks can be found at Target, HomeGoods, TJMaxx, Kohl's,Gordman's, At Home Stores, Kirklands, Bed, Bath & Beyond, and at shoplindawoods.com. 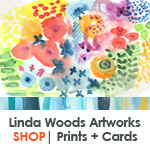 For information on licensing artwork, please send an email (LindaWoodsArt@gmail.com).